When 140 Hope players began preparations for the 2012 season they signaled the beginning of a new era in the 103-year history of Flying Dutchmen football. 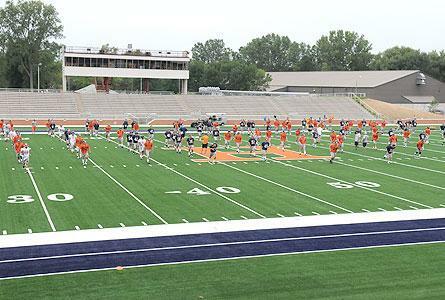 Coach Dean Kreps and his staff greeted the team on the new artificial turf of Holland Municipal Stadium which will in the coming months become the Hope College Football Stadium. Already emblazoned with the word HOPE across each end zone and by a huge orange letter "H" at mid-field, the college is in the process of acquiring the facility from the City of Holland. Hope and Holland High School will share the stadium for their home football games, something they've done every season dating back to 1932 when the teams began playing at old Riverview Park. They've shared Holland Municipal Stadium since the 1979 season. Holland High will have the first chance to play at the stadium when the Dutch host Forest Hills Central on Thursday, Aug. 30. Two days later on Labor Day weekend Saturday (Sept. 1) the Flying Dutchmen will launch their season with the traditional Community Day game against North Park, Ill.
Hope football fans will get an early opportunity to see the field when the team hosts it annual Orange and Blue intra-squad scrimmage on Saturday, Aug. 25, under the stadium's new lights at 7 p.m.